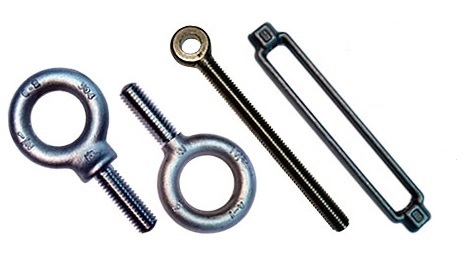 IQS Directory provides a detailed list of eye bolt manufacturers and suppliers. Find eye bolt companies that can design, engineer, and manufacture eye bolts to your specifications. Peruse our website to review and discover top eye bolt manufacturers with roll over ads and complete product descriptions. Connect with the eye bolt companies through our hassle-free and efficient request for quote form. You are provided company profiles, website links, locations, phone numbers, product videos, and product information. Read reviews and stay informed with product new articles. Whether you are looking for manufacturers of lifting eye bolts, cable eye bolts, and industrial eye bolts of every type, IQS is the premier source for you. Our eye bolts are made from the highest quality materials we can find. We manufacture our products using high-quality metals, such as stainless steel. All our fasteners use the most time and cost-efficient manufacturing techniques so that our customers around the world can get their products faster. If you would like to learn more, visit our website or give us a call today! Looking for some of the best eye bolts in the business? Look no further! We provide the best and most refined selection of eye bolts in the industry. We are serious when it comes to quality and make sure that we have a dedicated team of seasoned professional working to ensure that your customer experience is enjoyable. We devote extra attention to making exceptional products that work to your advantage. For more information on eye bolts, give us a call today! We believe in building customers for life, which is why we always put our customers first. For 30 years, we have been able to provide the best in customer satisfaction through quality, durability, reliability, and affordability. We have eye bolts that are made from quality materials while maintaining low prices. Find out what sets us apart online, or give us a call! Bolts, also known as screws, are components that are utilized to fasten objects together, and are structured to withstand high levels of tension. Eye bolts are distinguishable from other bolts in that they feature a circular loop or “eye” instead of a standard head, and a thread on the other end. The eye on the bolt is used for many purposes, such as acting as a guide for chains, cables, or ropes in lifting applications, for guiding wires in electronic systems, or for assisting in tie-downs. Eye bolts can fall under the categories of open or closed. This depends on whether or not the eye on the bolt features an opening, or forms a complete circle. Closed eye bolts, also known as turned eye bolts, can be welded together at the joining. The opening on an open eye bolt usually matches the diameter of the bolt’s rod. Eye bolts that are made with a shoulder are capable of handling angled loads, such as in lifting or rigging applications. Eye bolts that do not feature shoulders are recommended for lifting applications that are lightweight and won’t pull on the bolt at an angle. Eye bolts can be categorized in several ways in order to define which eye bolts are suitable for lifting different vertical loads. The main types of eye bolts are as follows. Forged eye bolts. These bolts get their name from the process in which they are manufactured. These bolts have a high load rating and are thus suitable for lifting applications. Screw eyes. Screw eyes are bolts that have a head shaped like a loop. These bolts are commonly found guiding cable or wire, or rigging applications. Shoulder eye bolts. These bolts are characterized by a shoulder that is located right under the eye. Thimble eyebolts. These bolts are typically used to guide ropes and cables, and feature an opening that takes on the role of a thimble in order to reduce wear and tear. Pivoting eyebolts. They are designed to pivot 180 degrees, making them more flexible. Swiveling eyebolts. They are similar to the pivoting eyebolt in that they are capable of rotating. However, unlike the pivoting eyebolts, the base of a swiveling bolt is designed to rotate 360 degrees. Eye bolts are typically made from either titanium, steel, or aluminum. All of these metals are highly durable and capable of withstanding stress and pressure. The most common materials used for eye bolts is stainless steel and galvanized steel. Stainless steel is a very strong metal with a high level of corrosion resistance, and is therefore used in applications that involve exposure to high temperatures and excessive moisture. Galvanized steel, however, is not quite as resistant to the elements as stainless steel. However, it is more inexpensive than stainless steel, and its strength and durability make it a popular material to use for bolts in simple anchoring and lifting applications. Steel and stainless steel are known for their high load ratings, and are thus utilized in a wide range of industries including: rigging, architectural, marine, and building construction. Titanium is used in specialized scientific or aerospace applications. The lightest of the materials is aluminum. Therefore, bolts made from aluminum should only be used for applications that do not involve heavy-duty lifting. Forging is a common method to manufacture eye bolts. More specifically, the most popular forging method is hot forging. The hot forging process involves the deformation of a metal alloy at a temperature above its recrystallization point, and then shaping it to the desired form. The temperature depends on the desired type of metal. For instance, an aluminum alloy can be forged at temperatures ranging from 680-1148 degrees Fahrenheit (360-620 degrees Celsius). Copper alloys such as bronze and brass, however, require a much higher temperature range—around 1292-1472 degrees Fahrenheit (700-811 degrees Celsius). Once the alloy is melted, it can either be quenched or annealed. In the quenching process, the melted metal is rapidly cooled and hardened with the use of water or sometimes additional chemicals. Annealing, on the other hand, involves cooling the metal slowly, enabling the manufacturer to manipulate the metal more easily. Hot forging is a recommended method to manufacture eye bolts, because it gives manufacturers the ability to form the metal into intricate designs. Numerous finishing options are available, such as heat treating, plating, and painting. Eye Bolts – Ken Forging, Inc.